Fujita, E., Kozono, T., Ueda, H., Kohno, Y., Yoshioka, S., Toda, N., Kikuchi, A., and Ida, Y. (2013), Stress field change around the Mount Fuji volcano magma system caused by the Tohoku megathrust earthquake, Japan, Bulletin of Volcanology, 75:679. Kumagai, T., Palacios, P., Ruiz, M., Yepes, H., and Kozono, T. (2011), Ascending seismic source during an explosive eruption at Tungurahua volcano, Ecuador, Geophysical Research Letters, 38, L01306. Kozono, T., and Koyaguchi, T. (2010), A simple formula for calculating porosity of magma in volcanic conduits during dome-forming eruptions, Earth, Planets and Space, 62, p483-488. 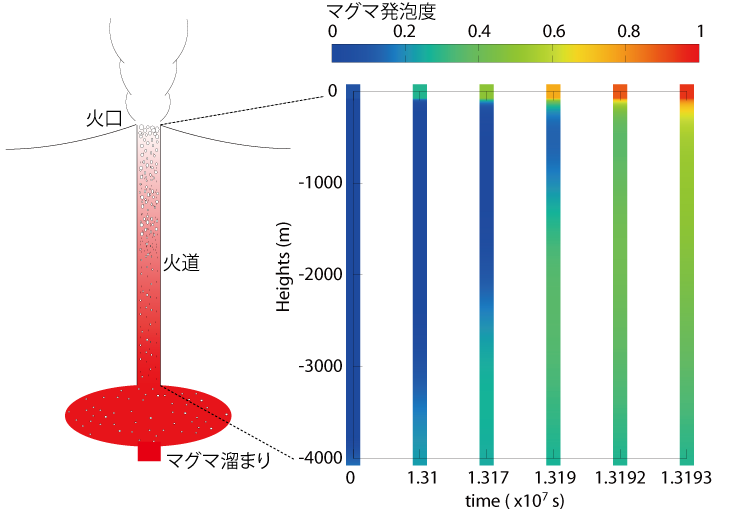 Koyaguchi, T., Suzuki, Y.J., and Kozono, T. (2010), Effects of the crater on eruption column dynamics, Journal of Geophysical Research, 115, B07205. Kozono, T., and Mitani, N.K. (2006), Modeling of 1-dimensional steady flow in volcanic conduits: a review (in Japanese with English abstract), Japanese Magazine of Mineralogical and Petrological Sciences, 35, p166-176. Kozono, T., and Koyaguchi, T., Effects of lateral gas escape on transitions from lava dome eruptions to explosive eruptions, IUGG 2011, V08-3129, Melbourne, Australia, 2011/7/6. Kozono, T., and Koyaguchi, T., Effects of Vertical and Lateral Gas Escapes on Volatile Compositions, Magma Porosity and Pressure in Volcanic Conduits during Dome-forming Eruptions, Cities on Volcanoes 6, 1.1-P-33, Tenerife, 2010/5/31. Kozono, T., and Koyaguchi, T., Effects of relative motion between liquid and gas on transition of eruption styles: conditions for effusive eruptions, IAVCEI (International Association of Volcanology and Chemistry of the Earth's Interior) General Assembly 2004, s03d_pm_116, Pucon, Chile, 2004/11/15. Kozono, T., and Koyaguchi, T., Effects of relative motion between liquid and gas on transition of eruption styles, IUGG (International Union of Geodesy and Geophysics) 2003, V10/01A/D-022, Sapporo, Japan, 2003/7/1. 小園誠史, 上田英樹, 長井雅史, 霧島山新燃岳2011年サブプリニー式噴火における火道流のダイナミクス， 日本地球惑星科学連合2013年大会, SVC50-P06, 幕張メッセ・千葉, 2013/5/20. 小園誠史, 上田英樹, 小澤拓, 小屋口剛博, 藤田英輔, 東宮昭彦, 鈴木雄治郎 傾斜変動データとSAR衛星画像に基づく2011年霧島山新燃岳噴火におけるマグマ噴出過程の把握， 日本火山学会2012年秋季大会, B1-19, エコールみよた・長野, 2012/10/14. 小園誠史, 小屋口剛博， 脱ガスと結晶化が溶岩ドームから爆発的噴火への遷移過程に与える影響， 日本地球惑星科学連合2012年大会, SVC54-P08, 幕張メッセ・千葉, 2012/5/20. 小園誠史, 瀧本浩史, 鵜川元雄, 藤田英輔, 實渕哲也, 小屋口剛博, 石峯康浩， 霧島山新燃岳における火山噴煙のPIV解析， 日本火山学会2011年秋季大会, A1-16, 旭川市大雪クリスタルホール, 2011/10/2. 小園誠史, 小屋口剛博， 横方向脱ガスが溶岩ドーム噴火から爆発的噴火への遷移過程に与える効果， 日本地球惑星科学連合2011年大会, SVC0047-06, 幕張メッセ・千葉, 2011/5/24. 小園誠史, 上田英樹, 小澤拓, 小屋口剛博, 藤田英輔, 鵜川元雄, 棚田俊收， 傾斜変動データに基づく2011年新燃岳噴火におけるマグマ噴出率の見積もり， 日本地球惑星科学連合2011年大会, SVC070-P35, 幕張メッセ・千葉, 2011/5/23. 小園誠史, 藤田英輔, 上田英樹, 火山噴火パラメータのデータベース構築, 日本火山学会2010年秋季大会, P05, 京都大学, 2010/10/9. 小園誠史, 小屋口剛博, 縦方向・横方向の脱ガス過程が溶岩ドーム噴火における火道内の揮発成分組成・マグマ空隙率・圧力の分布に与える効果, 日本地球惑星科学連合2010年大会, SVC063-08, 幕張メッセ・千葉, 2010/5/24. 小園誠史, 小屋口剛博, マグマの流量と粘性が溶岩ドーム噴火における火道中のマグマ空隙率変化に与える効果, 日本地球惑星科学連合2009年大会, V159-038, 幕張メッセ・千葉, 2009/5/17. 小園誠史, 小屋口剛博, 田中宏幸, 平秀昭, 薩摩硫黄島火山硫黄岳の火道浅部密度構造解析：3. 火道流モデルに基づく解析, 日本地球惑星科学連合2009年大会, V160-003, 幕張メッセ・千葉, 2009/5/18. 小園誠史, 小屋口剛博, 溶岩ドーム噴火における火道中のマグマの空隙率変化」, 日本地球惑星科学連合2008年大会, V151-016, 幕張メッセ・千葉, 2008/5/26. 小園誠史, 小屋口剛博, 気相・液相間の相対運動が一次元定常火道流に与える効果：噴火タイプの多様性の成因, 日本地球惑星科学連合2007年大会, V238-010, 幕張メッセ・千葉, 2007/5/24. 小園誠史, 小屋口剛博, 一次元定常火道流の解析的研究：縦方向への脱ガス過程による非爆発的噴火の存在条件, 日本地球惑星科学連合2006年大会, V201-011, 幕張メッセ・千葉, 2006/5/14. 小園誠史, 小屋口剛博, 気相・液相間の相対運動が爆発的噴火のダイナミックスに与える効果：層流脱ガスと乱流脱ガスの違い, 日本火山学会2005年秋季大会, B25, 北海道大学・札幌, 2005/10/7. 小園誠史, 小屋口剛博, 気相・液相間の相対運動が爆発的噴火のダイナミックスに与える効果, 2005年度地球惑星合同大会, V075-012, 幕張メッセ・千葉, 2005/5/25. 小園誠史, 小屋口剛博, 気相・液相間の相対運動が噴火タイプの多様性に与える効果（その２）：非爆発的な噴火の条件, 2003年度火山学会秋季大会, A25, 九州大学・福岡, 2003/10/11. 小園誠史, 小屋口剛博, 気相・液相間の相対運動が噴火タイプの多様性に与える効果, 2003年度地球惑星合同大会, V080-P009, 幕張メッセ・千葉, 2003/5/29. Kozono, T., and Koyaguchi, T., Effects of gas escape and crystallization on the complexity of conduit flow dynamics during lava dome eruptions, International Workshop on High Energy Geophysics 2011, Happo-en, Tokyo, 2011/10/27. Kozono, T., Tanaka, H.K.M., and Koyaguchi, T., Imaging Density Distribution of a Big Object by Muography and its Application to the Analysis of Gas-liquid Two-phase Flow in a Conduit during Volcanic Eruption, 3rd International Forum on High Energy Geophysics: Muon and Neutrino Radiography, NuTRAck and MuRAY Joint Meeting, Forest Hongo, Tokyo, 2010/3/9. 小園誠史, 火山噴火の一次元定常火道流モデルのレビュー　－脱ガス・気液間の相対速度・火道の形状について－, 特定領域研究「火山爆発のダイナミックス」研究集会, 山中共同研修所・山梨, 2004/7/17. Copyright(C) 国立研究開発法人防災科学技術研究所 All rights reserved.